Electronics are getting smaller and smaller, flirting with new devices at the atomic scale. However, many scientists predict that the shrinking of our technology is reaching an end. Without an alternative to silicon-based technologies, the miniaturization of our electronics will stop. One promising alternative is graphene  the thinnest material known to man. Pure graphene is not a semiconductor, but it can be altered to display exceptional electrical behavior. Finding the best graphene-based nanomaterials could usher in a new era of nanoelectronics, optics, and spintronics (an emerging technology that uses the spin of electrons to store and process information in exceptionally small electronics). Scientists at Rensselaer Polytechnic Institute have used the capabilities of one of the world's most powerful university-based supercomputers, the Rensselaer Center for Nanotechnology Innovations (CCNI), to uncover the properties of a promising form of graphene, known as graphene nanowiggles. What they found was that graphitic nanoribbons can be segmented into several different surface structures called nanowiggles. Each of these structures produces highly different magnetic and conductive properties. The findings provide a blueprint that scientists can use to literally pick and choose a graphene nanostructure that is tuned and customized for a different task or device. The work provides an important base of knowledge on these highly useful nanomaterials. The findings were published in the journal Physical Review Letters in a paper titled "Emergence of Atypical Properties in Assembled Graphene Nanoribbons." "Graphene nanomaterials have plenty of nice properties, but to date it has been very difficult to build defect-free graphene nanostructures. So these hard-to-reproduce nanostructures created a near insurmountable barrier between innovation and the market," said Vincent Meunier, the Gail and Jeffrey L. Kodosky '70 Constellation Professor of Physics, Information Technology, and Entrepreneurship at Rensselaer. "The advantage of graphene nanowiggles is that they can easily and quickly be produced very long and clean." 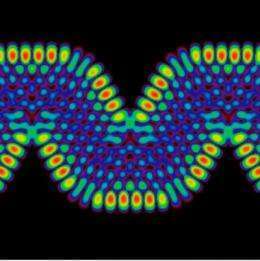 Nanowiggles were only recently discovered by a group led by scientists at EMPA, Switzerland. These particular nanoribbons are formed using a bottom-up approach, since they are chemically assembled atom by atom. This represents a very different approach to the standard graphene material design process that takes an existing material and attempts to cut it into a new structure. The process often creates a material that is not perfectly straight, but has small zigzags on its edges. Meunier and his research team saw the potential of this new material. The nanowiggles could be easily manufactured and modified to display exceptional electrical conductive properties. Meunier and his team immediately set to work to dissect the nanowiggles to better understand possible future applications. "What we found in our analysis of the nanowiggles' properties was even more surprising than previously thought," Meunier said. The scientists used computational analysis to study several different nanowiggle structures. The structures are named based on the shape of their edges and include armchair, armchair/zigzag, zigzag, and zigzag/armchair. All of the nanoribbon-edge structures have a wiggly appearance like a caterpillar inching across a leaf. Meunier named the four structures nanowiggles and each wiggle produced exceptionally different properties. They found that the different nanowiggles produced highly varied band gaps. A band gap determines the levels of electrical conductivity of a solid material. They also found that different nanowiggles exhibited up to five highly varied magnetic properties. With this knowledge, scientists will be able to tune the bandgap and magnetic properties of a nanostructure based on their application, according to Meunier. Meunier would like the research to inform the design of new and better devices. "We have created a roadmap that can allow for nanomaterials to be easily built and customized for applications from photovoltaics to semiconductors and, importantly, spintronics," he said. By using CCNI, Meunier was able to complete these sophisticated calculations in a few months. "Without CCNI, these calculations would still be continuing a year later and we would not yet have made this exciting discovery. Clearly this research is an excellent example illustrating the key role of CCNI in predictive fundamental science," he said. To be fair, they did not make all of that easy to do. Making it and making enough of it, all properly arranged and connected, is far from easy. semiconductor masks are pretty good, but not close to being that good. Right you have to make each one of those wiggles by hand. Saying that they made this easy is akin to giving someone a ten pound bag of shredded money and saying you made them rich. One step closer to zoolander's phone. I think you're making an assumption. Seeing as they don't tell us the exact method they're using, we don't know if they're positioning each atom with an electron microscope or if you just dump a solution in a bowl and it self assembles. I think we need more info to determine the viability of this method making it to consumer applications. They aren't making anything. It is all computer models. The only thing they did was tell people what to expect if they happen to make one of these things. But before any of it is truely useful, they don't have to make just one, they have to make billions and billions of them, precisely positioned and connected. Yeah, its great to know what their properties will be, but they did not make anything related to this field "easy".